The top panel in this picture from their paper shows the inner region they observed, and all the white blobs are the compact sources they were looking for. What caught their interest though was the line of objects toward the top right of this image. This, they reasoned, wasn’t a chance alignment but could either be a chain of supernovae in a super star cluster approximately 500 years old, or a core and jet of a hidden AGN. Normally, if a galaxy (or pair of interacting galaxies) hosts an AGN its output dwarfs the light coming from all the stars in the galaxy combined. However, sometimes (and possibly more often than we realise) the AGN is weak and can only be seen if you really go looking for it. Super star clusters are known to exist in Arp 299. However, finding four supernovae in one this size and age is very unlikely they reasoned, as it shouldn’t have housed enough massive stars for this to happen. So they had a closer look – the middle and bottom panels of the picture show their close ups of the top right region (indicated by white dotted lines). See how the blobs are linked in the bottom image? 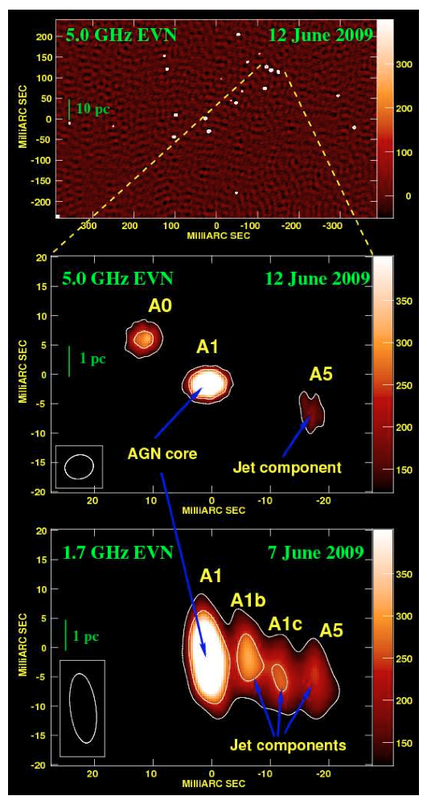 That, they concluded is a clear indication of an AGN core with accompanying radio jet. Interestingly, the object labelled A0 isn’t part of the AGN, but has all the characteristics of a young supernova, making it, as they note, “…one of the closest to a central supermassive black hole ever detected.” This could be the reason why Arp 299’s AGN is so weak – nearby massive stars heating their surroundings and dispelling the material that it would normally accrete. 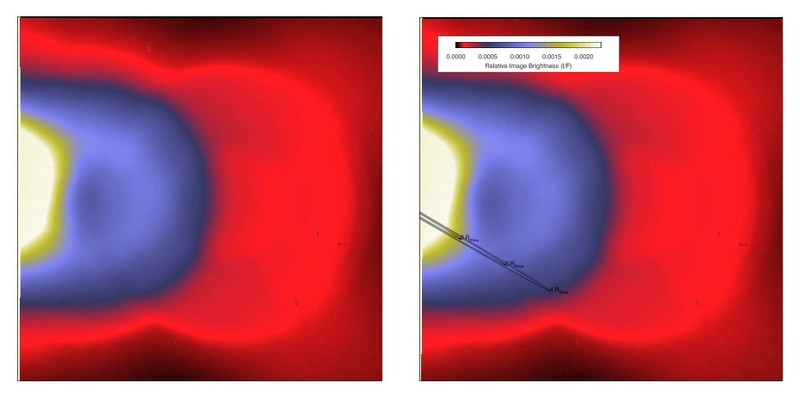 All three of these are radio images, taken at a frequency of 5 GHz (top and middle) and 1.7 GHz (bottom) with an array of linked radio telescopes stretching from Shanghai to Cambridge . Radio is ideal for this investigation as it is not absorbed by the large amounts of dust enshrouding Arp 299’s nuclear region. Just goes to show what you can find when you don’t go looking for it. I am interested in learning more about how astronomers use Twitter. Can someone give me some concrete examples of how people are actually use Twitter in their daily work? Thank you! Well, Bruce I’m sure there are lots of sensible answers to this question, but if you happened to pass by Twitter this morning you’ll have seen just what astronomers get up to when they should be working! A brilliant #astromovies hashtag started by @adam_avison has been bringing out everyone’s creative side. @astronomyblog has collected together some of the best so far on his blog but new ones are coming every minute (recent good ones include: Spiral Galaxy Quest: @zemogle, Indecent HST Proposal: @dalebotha, emmission impossible: @astrologerthe, For Better or Voorwerps: @NGC3314). Now the US is waking up it’ll be interesting to see what they can come up with! I love libraries. I’m a member of four, not including University ones. Without libraries and the ability to borrow whatever I fancy, I think I’d be broke and living in a book-cave! So, I was sad this morning to hear that the number of adults visiting libraries in the UK has been decreasing steadily over the past couple of years. “Ok”, I almost hear Niall saying, “that’s all very well Emma but this is an astronomy blog, do you have a point?” Well I can’t do anything about the drop in library visitors (except go more frequently myself and urge you all to do the same), but I can blog a little about one essential type of library used by astronomers. The Herschel Space Observatory, launched last year, carries several spectrometers which are used to analyze the far-infrared light and look for the signatures of different chemicals that might be present. Obviously this only works if you can identify what it is that you’ve detected, and this is where the American Museum of Natural History comes in. They’ve got a large number of different minerals in their collection which they’ve been using to create a high-quality library of infrared spectra to which the Herschel data can be compared. This library might not feed anyone’s book habit, but it could potentially be vital in understanding the composition of various parts of the Universe. Interesting fact of the day: examining the fossil record suggests that mass extinctions on Earth occur approximately once every 26 million years (Myr). One possible explanation for this is a companion dwarf star to the Sun on a 26 Myr orbit. Every time is passes by, the theory goes, it messes up the Oort cloud and throws comets our way, greatly increasing the possibility of a collision (and all the nasty effects that could go with it). This potential star was christened Nemesis for obvious reasons. 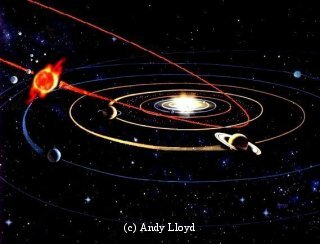 If Nemesis exists then its orbital period (the time it takes to complete one orbit) is predicted to vary by a few Myr every orbit, because of the influence of other stars in the Galaxy. Remember this – it will be important later! The theory that the mass extinction periodicity is caused by the Nemesis companion star was first suggested in 1984. Since then the quality of the fossil record datasets has improved significantly which has led two scientists, Adrian Melott and Richard Bambach to re-examine the hypothesis using these new modern data. They found strong evidence that mass extinctions have been occurring every 26.8 Myr, stretching back over 500 Myr (interesting aside: that’s approximately as far back as they could go in the fossil record apparently, as that’s how long things with hard body parts, which make good fossils, have existed). Their results seem at first glance to support the existence of Nemesis. However, the mass extinctions they see are too regular – if they were being triggered by the visits of Nemesis the gap between them should vary more, given the predicted variation in the length of the star’s orbit. If Nemesis isn’t responsible for these apparently regular extinctions then what is? The alternative explanations range from oscillations in the galactic plane to geological instabilities in the Earth itself, and if someone publishes new research on any of them I’ll maybe try and explain them too. One final thing to note: if Nemesis is out there after all, the new all-sky surveys to be carried out by Pan-Starrs, WISE or the planned LSST should see it. Yep. 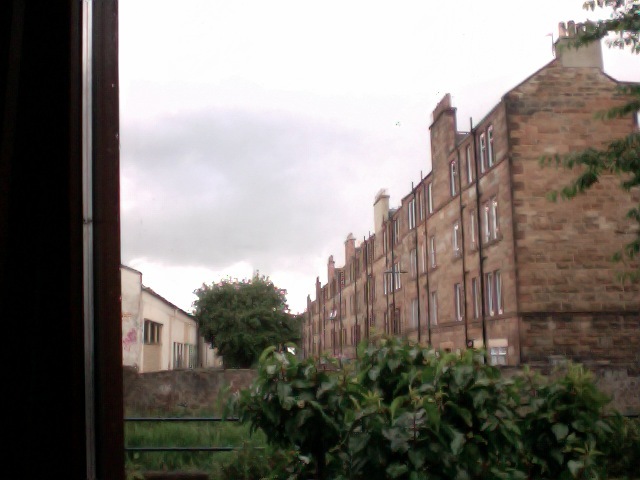 the clouds had broken up but were annoyingly blocking the bit of sky with all the flaming rocks. Hmph. So I gave up and went to bed. My dad, further south than me, managed to see one before clouds came over there too. Lots of other people were having much better luck though, and gleefully reporting their sightings using the #meteorwatch hashtag on twitter. 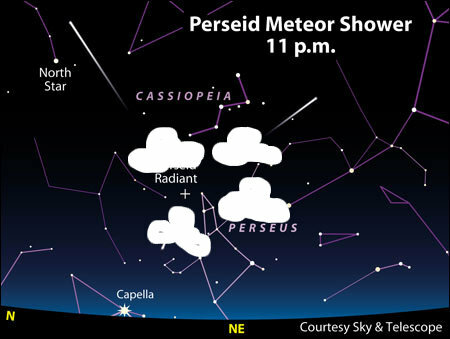 The weather’s looking a lot more hopeful today and there should still be a lot of meteors to come. I’m keeping my fingers crossed for tonight. Failing that I can always just listen to them instead! This afternoon I set myself a challenge – take a paper published on the astronomy arXiv today and blog about it by the end of the day. Luckily for me an intriguing non-detection in our own Solar System popped up. Back in 2008 it was widely reported that the Cassini spacecraft had detected a ring system around Saturn’s fifth moon, Rhea (that’s it in the images above). These rings weren’t directly seen, but rather something seemed to be absorbing the electrons, which are normally trapped by Saturn’s magnetosphere, in the region surrounding the moon. Three narrow rings of icy material were the most likely explanation; this was the first time such phenomena had been observed around anything other than a planet and caused a lot of interest and excitement. The authors of the paper published today decided to search for these moon-rings directly. 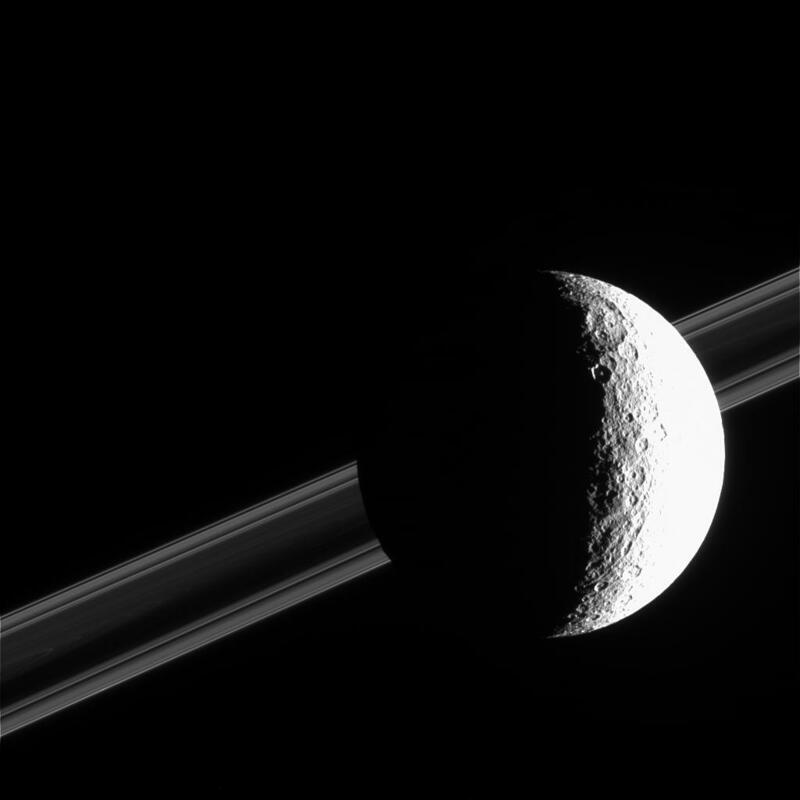 They used Cassini’s narrow angle camera to take deep, high resolution, pictures of Rhea. And they found……..nothing. 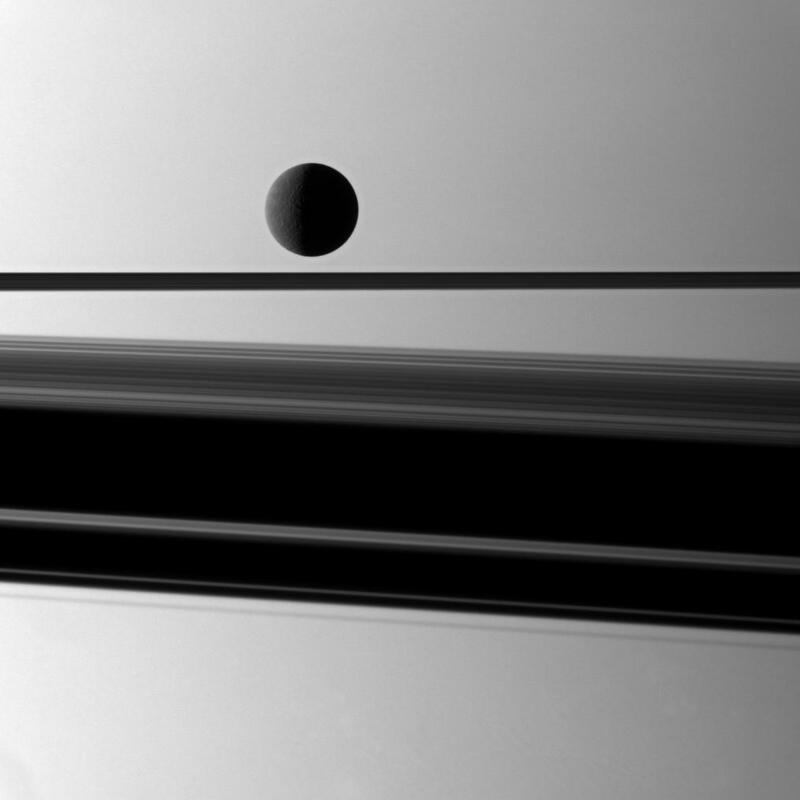 One of the Cassini images from Tiscareno et al. (2010) of the region surrounding Rhea. The black lines in the identical right-hand image show where rings should be seen if they were present. Rhea itself is off the image, to the left. So, does this mean that there aren’t rings around Rhea after all? Well, it certainly looks that way. The new data rule out both narrow rings or a broad dusty cloud of material as the likely cause of the electron absorption. Ok, no rings. So, does this mean that the 2008 observations were wrong? No, something is definitely absorbing the electrons near the moon, but the interpretation for why this is happening needs rethinking. Sometimes not seeing what you think should be there is more exciting than actually detecting it! Quick post, but I couldn’t resist putting up this beautiful picture which was Astronomy Picture of the Day last week. It also gives me chance to shamelessly plug the APOD site where you can get a different astro-fix every day! The image itself is a composite of a downwards pointing fisheye view stitched together with wide angle shots of the surrounding area. 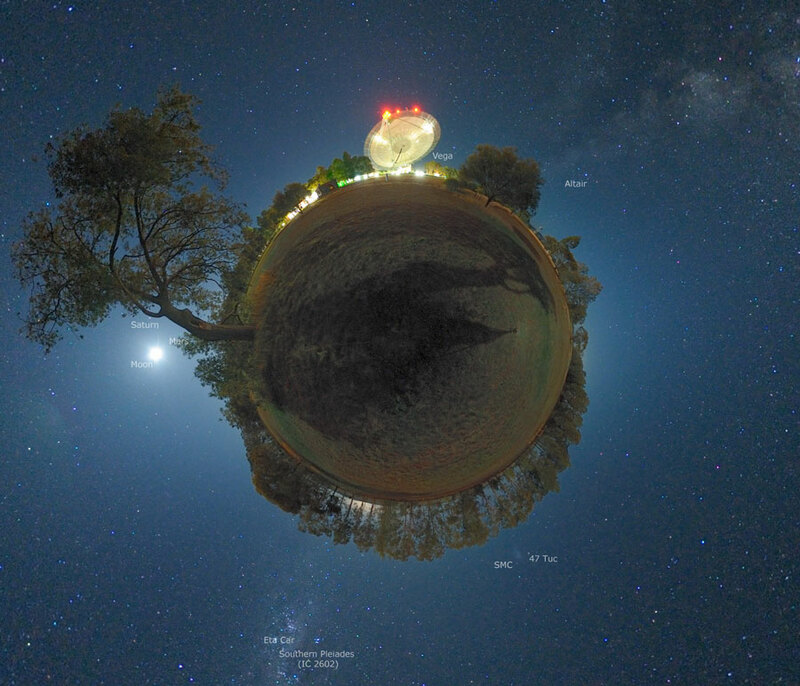 It manages to combine the Parkes Radio Telescope in Australia with lots of night-sky features and a rather nicely shaped tree. It was created by Alex Cherney from Terrastro, and there’s also an unstitched, interactive, version here.